Almost Home…the SS Sultana Tragedy – Mark Loves History! 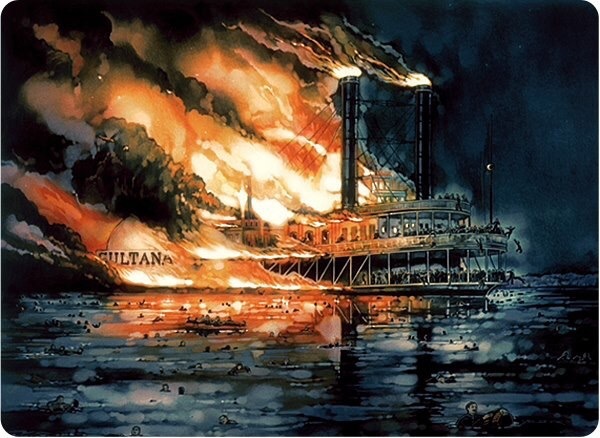 Today in History, April 27: 1865 – The SS Sultana. They had left their farms, their jobs and their families, to fight for the Union, some for glory, some for honor. Any glory in the war faded, as it always must, as they fought through terrible battles. They saw their friends die mutilated, many of them suffered irreparable injuries. Then they were captured by their enemy and sent to horrific prison camps such as the despised Andersonville. Conditions there were unspeakable; even if the Confederates had any sympathy for them, the South didn’t have the resources to care for it’s own, much less it’s prisoners. Finally after months or years of starvation and brutality, the war was over; they were liberated. They were going home! Can you imagine the joy, the rapture they must have felt? Most had to have believed it would never happen, that they would die in their captivity. They marched (those that could still walk) to ports on the Mississippi to board steamships for the trip north and home. Desperate to get home as quickly as possible, they begged, cajoled, bartered or simply boarded the overloaded river boats clandestinely. You can take just one more, right? The steamer SS Sultana was one of those commissioned by the Union Government to get them home. Her capacity was for 376 passengers. 376. By the time she sailed from the captured city of Vicksburg, MS she was loaded down with at least 2,400…mostly those Union prisoners on their way home. At 2 AM on the 27th of April her decks and quarters were jammed beyond capacity, but their must have been peace amongst the passengers. The ship was top heavy and as she made the turns of the river, the water in her inter-connected boilers sloshed back and forth, lowering the water levels in the boilers opposite the turn. One of the boilers had been hastily patched to allow her use on the trip. Suddenly, one of the boilers burst, causing at least two more to follow. The ship exploded, the suddenly escaping steam burned hundreds to death in an instant, setting the wooden ship afire to kill hundreds more. Most of those that managed to escape the ship into the water, already emaciated, drowned before they could be rescued; the first ship to reach them was an hour away in the frigid waters. Of the 2,400, as many as 1,900 perished. 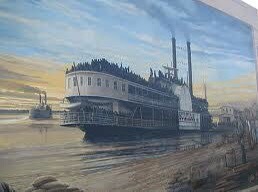 7 to 9 miles above Memphis on the river, even the recently defeated Confederates there responded with compassion, opening their homes to the few survivors.